A must read for every fantasy fan.This is the series that created orcs in the first place. Tolkien writes in a style that no longer exists and the world is a darker place without it. His writing is so descriptive and beautiful that I physically wanted to leave my dorm and fight orcs in the battle of Gondor. His work is so influential that you will see themes he created in modern writers today. My favorite series and a true master piece. As always: The father of fantasy. I'm a rabid fan of this...I love it. There's always something new each time you read it. I am rather surprised that CC doesn't have the best of the best fantasy novels: The Lord of The Rings Trilogy. 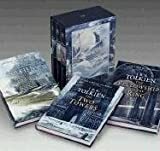 Anyone wanting to write well, especially for fantasy, can do no better than to take a leaf out of Tolkeins book.